More on hacking Fate Core (Evil Hat Productions) to play Castle Falkenstein (R. Talsorian Games) (see the last three posts for more). I’m musing about how to translate weapons and harm. High success, when the attack result was equal to or greater than twice the defense result. Armour was described as rarely used, providing at most one point of protection and restricting movement. A new option provided light, medium and heavy armour ratings which would stop all hits up to a certain harm rank (B, C, and D respectively), but for anyone but dragons or people inside vehicles, armour remained pretty much non-existent for most player characters. How Should It Work in Fate? Castle Falkenstein was intended to be swashbuckling and dramatic, which is a perfect match for Fate Core; but I’m not sure it can be done in the same way here. Yes, we could assign damage point values to weapons like the option discussed in Fate Core, pp. 277-278, but in Fate this would give a much deadlier result, especially without armour to counter the damage. But I’m really wondering whether this will help or hinder, whether it’s too lethal, and whether it’s an unnecessary complication added merely because it was there 20 years ago. For one thing, the harm rank table from Comme Il Faut describes action results, not just intrinsic values. It could certainly serve as a useful guideline for creating a new weapon damage table, and I can see why we wouldn’t expect damage landed by a hatpin, a pepperbox revolver, and a sabre to look the same. But we could also handle that through consequences, couldn’t we? What do you think, how would you choose to handle damage in your own “Fate of Falkenstein” game? 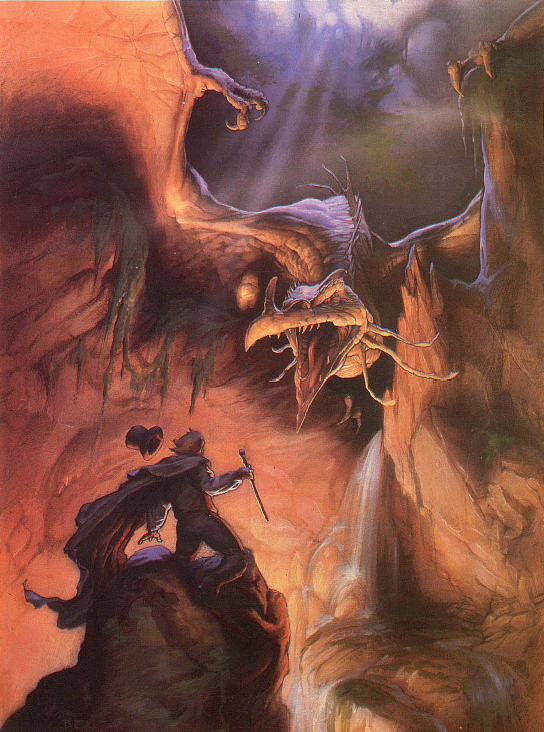 Image by William Eaken, 1994 from Castle Falkenstein (R. Talsorian Games). Used without permission, no copyright challenge intended. Posted on December 27, 2013 December 29, 2013 by mechanteanemonePosted in fiction, games, rpgsTagged Castle Falkenstein, Evil Hat Productions, fantasy, FATE, Fate Core, games, R. Talsorian, rpgs, steampunk. I’d be inclined to deviate from Castle Falkenstein and go a more SotC route here. Average weapons do no extra shifts and gadgets can add it as a build option. I suppose we could add weapons as stunts (as I currently have it in the draft War of Ashes RPG) or as aspects. 0) Give Light Armor a +1 Armor Value, and let it absorb a Boost. For the time period, this is basically Heavy Cloth and Leather. 1) Give Medium Armor a +2 Armor Value and let it absorb a Boost, and a Minor Consequence. For the time period, probably Leather and a Metal Breastplate (and expensive), or being in a lightly armored carriage. 2) Give Heavy Armor a +3 Armor Value and let it absorb a Boost, a Minor Consequence, and a Major Consequence. For the time period, probably medium-ish vehicle armor (the most you’d have on a carriage, but lighter than what you could do to a fully armored train compartment). Or, maybe being in a lightly armored carriage + wearing medium armor. 3) Just give Weapons numeric values implied by the above chart (A gets a +1, B gets a +2, F gets a +8). Though, I personally prefer to have A at +0 not +1 (fists should be +0, IMO). But the difference is negligible. 4) Stress Inflicted = Shifts + Weapon Value – Armor Value. 5) After step 4, you can further reduce the stress inflicted by degrading the armor value by the same amount. (short term benefit with a long term cost). 6) After step 5, you can chose to have the Armor absorb the boost or consequences. 7) If Armor has absorbed ALL of its capacity for boosts and consequences, AND been reduced to +0 value (through absorbing stress), THEN it is wrecked and useless. It is beyond repair. 8) If it has absorbed _some_ stress and/or _some_ boosts/consequences, then it merely needs some repairs to get back to its full value. Though, any ornamental/ceremonial value it might have had (bright shiny luster, fine etching decoration, etc.) is probably permanently lost, without some significant craftsmanship. Thank you for the comprehensive reply. It’s very much what my first idea was, but I’m still wrestling with the fact that, except for Dragons in their base form and people riding around in vehicles, no one has armour in New Europa. So swords and pistols would be very lethal, and duels deadly–which is true for many takes on a steampunk Victorian era, but doesn’t feel true to Castle Falkenstein.